Rajaram Dhakal, Chief of Meteorological Forecasting Division said that the snowfall was rather late this year and it will continue for some more days. KATHMANDU, Jan 25: Several mountain districts including Jumla, Humla, Manang, Mustang and Kalikot, among others received heavy snowfall on Wednesday. This has affected life in those districts. In Jumla, farmers expressed satisfaction over the changed weather. They had lamented the prolonged delay in snowfall in the region. In lack of snowfall, both the winter and summer crops get affected. “Now, we are a bit relieved. Snowfall means moisture for our fields and this helps the crops and vegetables to grow,” said Dilli Bahadur Rawat, a farmer from Tila Rural Municipality of Jumla. According to Rawat, any further delay in snowfall would have caused huge losses to farmers. “Earlier, we would receive snowfall in November or December. But this time it came so late, in January. We were so worried because the crops were about to die. Any further delay in the fall of the snow would mean we would be unable to save the crops in the fields,” he elaborated. 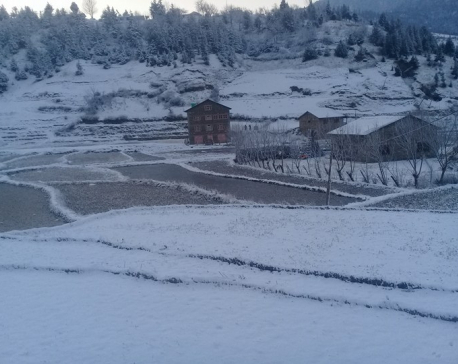 Jumla farmers collect the snow in artificial ponds and use the melted snow for irrigation. 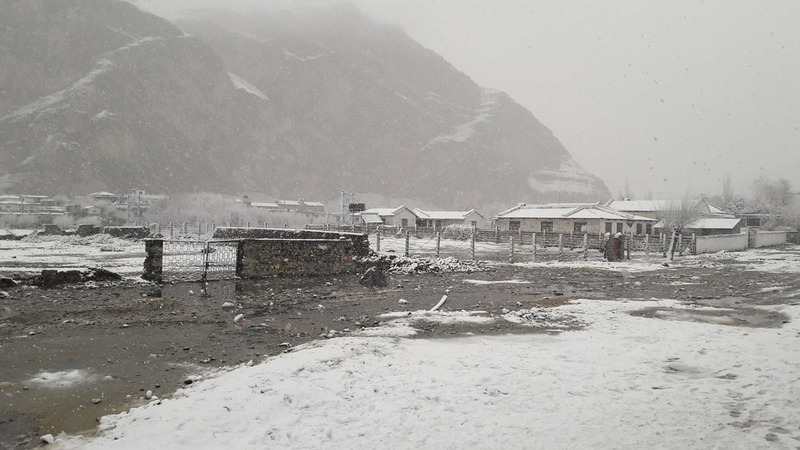 Locals in Manang reported of inconvenience in carrying out normal activities owing to heavy snowfall since Tuesday night. Winds and storms made matters worse for them. On Wednesday afternoon, some people had come out to play in the snow. They had been able to step out only around noon. “It was a bit scary at night. There were not just snowfall, heavy winds and storms followed,” said a local, Binesh Giri. “People were worried about themselves and their cattle,” he added. Extreme cold had kept most of the people inside their homes. The roads in Manang were empty till the afternoon. “This cold is unbearable in Manang and Lamjung. There are no cars, jeeps or buses on the road. Unless they have emergency, people do not come out of their houses,” said a bus driver Narayan Bhandari. Bhandari, who is a local of Manang, stated that he will drive only when the weather returns to normal. “Roads become dangerous in such weather. Even the visibility is low,” he said. 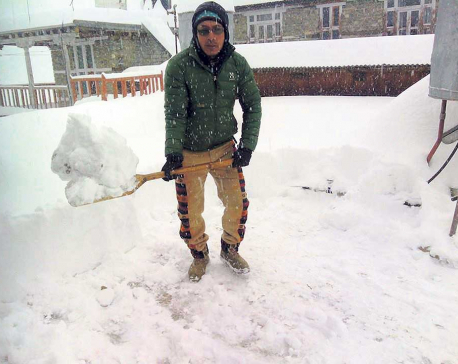 Khadak Pariyar, a businessman at Manang district headquarters Chame, lamented that the weather affected his business. The extreme weather has brought things to a standstill, he said. “It is not abnormal, yet it is quite difficult. We are not able to carry out our daily activities properly. Bad weather means loss to my business,” he said. Local administration in Kaski reported that heavy snowfall in the highlands of the district since Tuesday night has affected normal life. Though people welcomed it as the first snowfall of this winter, it made things difficult for many including drivers, the officials said. Meanwhile, Assistant CDO of Mustang, Ram Sundar Sharma said the people in the high hills are the most affected. Had there been only snowfall, it wouldn't be so bothersome for people, but strong winds kept them from venturing out of their homes, he noted. “Normally only the hilltops would see snow and the lowlands would remain unaffected. But Tuesday's night's snowfall was so heavy that the snow spread even to the low lying areas,” Sharma said. “Normal life indeed got affected,” he said. Meanwhile, Rajaram Dhakal, Chief of Meteorological Forecasting Division stated that the snowfall was rather late this year and it will continue for some more days. “The weather will be colder in the hill districts for a few days,” he said.